With an ever increasing demand to assist students to fund their tertiary studies each year, the Students Loan Bureau (SLB) continues to work assiduously to ensure that Jamaicans access the highest levels of education, in preparation for the local and international job markets. Executive Director of the SLB, Monica Brown, explains to JIS News that the demand for loans was one of the biggest challenges the agency faced in 2011, with some 13,600 applications received, compared to 10,000 in 2010. This represents a significant increase over the 400 applications which the SLB processed when it commenced operations 40 years ago. “It has put pressure on our very limited resources, not just staff, but in terms of the physical space,” Ms. Brown notes. Among the measures the SLB instituted to address the matter was an ‘On the Road’ campaign, which saw well over 3,000 applications processed, out of office. Under the outreach programme, SLB officers go out in the field where they collect the supporting documentation for applications, which are done online. Additionally, Ms. Brown explains that the officers convene guarantor interviews. “The ‘on the road’ campaign has really been positive in assisting us in dealing with the growing demand,” she says. The growing demand also translates into the need for more funding. “What we have estimated that we will be disbursing this year is approximately $3 billion. This compares to approximately $2 billion that was disbursed for the 10,000 applicants last year. So, that too is a challenge. But, we continue to do our best to put the funds together to deal with the demand. We have a mandate to provide tuition funding for students attending tertiary institutions, so we just have to find a way to deal with it,” the Executive Director states. To this end, the recapitalising of the SLB is at the forefront of discussions on the strengthening of the agency. “In addition to our collections, we have been borrowing from the private sector, as well as public sector entities. 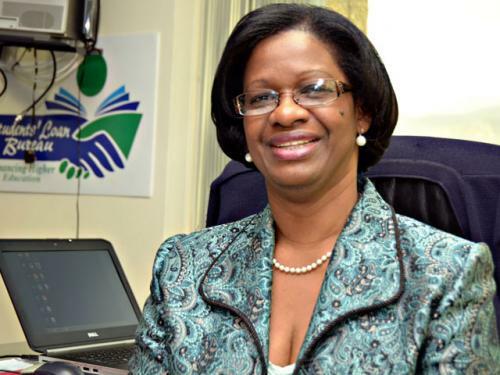 We are at the final stage of discussions with the PetroCaribe (Fund) for additional funding, to deal with the disbursements for 2011,” she tells JIS News. “We recently got a loan from the Caribbean Development Bank (CDB), and we have drawn down a good amount of that loan, so far,” Ms. Brown adds. But, while the SLB seeks out other areas of funding, it still relies heavily on repayment flows. “So, every opportunity we get, we implore; we encourage the beneficiaries who have got loans from the SLB, to repay their loans, because we place very heavy reliance on those collections to be able to grant new loans,” Ms. Brown explains. In 2010, the Bureau collected just under $1billion in repayment flows, but delinquency continues to be one of its biggest challenges. “More and more, given the economic environment, we are finding that a number of our beneficiaries are indicating to us that they are unemployed, so that compounds the delinquency problem. We are encouraging those persons to come in and speak with us, so that arrangements can be put in place to deal with their accounts. There are circumstances in which we can give consideration, for example, rescheduling the loan,” the executive Director says. Meanwhile, some $100 million was realised through the recently concluded amnesty, which ran from March to May of 2011. Under the amnesty, there was a 100 per cent waiver of all late fees that would have accrued on the loans. There was also a waiver of a percentage of the insurance and interest amount on the loan. She tells JIS News that this is necessary, as once loans fall into delinquency, it is very difficult for beneficiaries to bring them to a current state, particularly if persons are unemployed. “So, we are also encouraging the beneficiaries, where possible, to ask for assistance from their relatives, and guarantors to assist in repaying the loan, where they are not employed,” she adds. Ms. Brown informs that the guarantor policy was recently amended to allow for one guarantor, in instances where this guarantor is assessed as eligible to assume the credit risk. All loans are insured, but only against death or permanent mental or physical disability. There is currently no insurance to cover the SLB’s credit risk, but this is one of the issues that are currently under discussion. “So, a decision will be taken in due course as to where we go with that proposal,” the Executive Director says. Meanwhile, Ms. Brown points out that in an effort to collect as much as it can, the Bureau recently resumed the publication of the names of some delinquent borrowers and has also published names on the SLB website. “That has yielded some results, because we see quite a bit of activity in the office where people are coming in to settle,” she notes. She says that while the Bureau is moving to publish the photographs of the delinquents, with some to be published shortly, this is not a route the SLB wants to go, but they must recover funds in order to grant new loans. Beyond the publishing of names, Ms. Brown says the Bureau has to take legal action against persons who just refuse to pay, noting that there are some beneficiaries who are of the view that the loans are government funds, so they do not have to repay the money. The SLB on Tuesday (January 10) announced that commencing academic year 2012/2013, under its targeted loan facility, the standard loan tenure will now be 15 years from the current 10 years. This could be extended to a maximum of 20 years for persons who are undertaking degrees in programmes which exceed the general three or four-year duration, and attract higher tuition costs. For existing loans, the extension in tenure will be applied on a case by case basis. Since 2010, repayment periods have been extended by two years for some groups, particularly high tuition cost groups, such as those in medicine and law. Ms. Brown says this is in order to enable these persons to be in a better position to manage their monthly payments, as the SLB does recognise that these payments, relative to income, tend to be high. When applying for loans, persons must ensure that not only are the institutions accredited by the University Council of Jamaica (UCJ), but are in fact approved by the SLB. Ms. Brown points tells JIS News that the reduction in interest rates from 12 to nine per cent, effective April 2011, was one of the SLB’s major achievements for that year. “That has played a significant role in reducing the monthly payments for our beneficiaries. That was welcomed by everyone, moreso our beneficiaries,” she says. Additionally, effective this month, the insurance premium on loans (both in moratorium and repayment) has also been reduced from $1.50 per $1,000 of loans, to $0.60 per $1,000 of loan amounts. This amended policy allows for repayment insurance to be paid over the full repayment period of the loan, rather than the 24 months that previously obtained. This will also contribute to overall reduced monthly payments. Ms. Brown also notes the improvements in overall customer service. “We are not where we want to be, but relative to a year ago, there has been significant improvement in the level of customer service provided by the SLB,” she says. The Executive Director highlights the almost 100 per cent growth in demand as one of the significant highlights of the SLB’s four decades of offering student loan financing at the best rate of interest, with unmatched terms. She also cites the significant improvement in technology. “With 14,000 accounts, you need technology to assist. Technology has increased significantly, but we are not where we need to be. Plans are in place to change the information system that generates data. We expect that by early 2012, a new system will be in place to facilitate the increased demand,” she informs. Ms. Brown says that for 2012, the Bureau will continue to focus on collections. “Without the collection at the level that we want it to be, we are going to be very challenged in delivering the service that we need to deliver – granting loans. Also, the new data system should reduce significantly, the level of manual input that we have to do now,” she states. She says it is also anticipated that the SLB will be able to implement the reducing balance method of interest calculation, thus moving away from the current add on interest system. The SLB, which is Jamaica's premier student loan financing organisation, commenced operations in 1970. It became a statutory body in 1971, thereby being empowered to issue loans covering a percentage of tuition fees to Jamaican students pursuing higher education at tertiary institutions. The Bureau’s ability to lend is dependent on its revolving loan scheme.